If you think Subaru is just a little niche-market automaker catering to the all-wheel-drive wagon crowd, you might want to take another look. Subaru is experiencing great success right now, but they aren’t satisfied with their past achievements. Subaru is bringing three world premieres to the Tokyo Motor Show 2013 this month. And they will reveal the Subaru brands future design direction and more importantly, its technology and drivetrain direction. Subaru will debut the new Subaru VIZIV Evolution Concept in Japan and it shows where the brand is headed in the future. You may remember the Subaru VIZIV Concept which was exhibited at the 2013 Geneva International Motor Show. This is the advanced form of that future-generation crossover concept model, and it comes with new technology. This advanced model will feature a plug-in hybrid powertrain that Subaru says will power future Subaru automobiles. The plug-in hybrid system consists of a 1.6-liter Horizontally-Opposed direct injection turbo "DIT" engine, combined with a high-torque-compatible Lineartronic (CVT) with one front motor and two rear motors. The electric technology will feature Lithium-ion batteries. In addition, Subaru will illustrate to the world its goal for the future of safety technology with the adoption of an innovative autopilot system. The rear wheels of the VIZIV Evolution Concept are 100% motor-driven eliminating the need for a propeller shaft. This creates a lower floor that offers ample legroom for rear seat occupants despite its compact size. The engine configuration will allow the crossover to feature the stylish two-door design and still have room for a rear seat and four passenger seating. The plug-in hybrid will be very fuel-efficient. The motors start and drive the vehicle during low-speed or city driving, while the 1.6-liter DIT engine and high-efficiency Lineartronic take over on the highway. The new Concept vehicle will also use a Independent-rear-motor-driven Symmetrical AWD (All-Wheel drive) system. It will also come with the highly-effective next-generation Subaru "EyeSight" driving assistance system. Subaru will continue to grow their new hybrid technology and the new 2014 XV Crosstrek Hybrid launching next month is the first model. 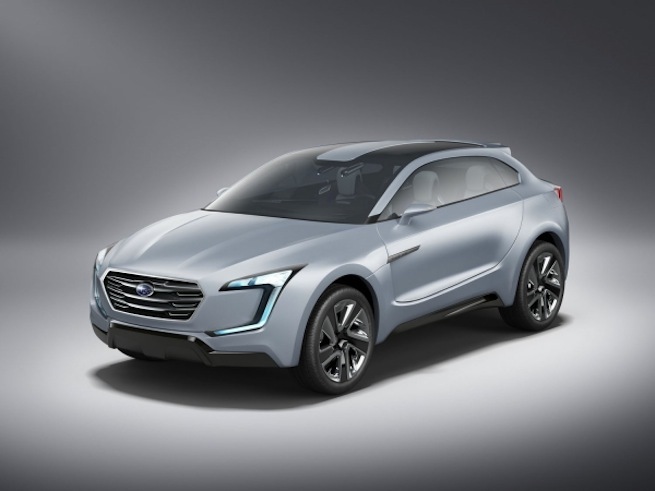 The new VIZIV Evolution Concept gives us an idea of what Subaru will offer in the future. They have been criticized for having dull and boring designs. They will take a radical shift and Subaru will move to new design philosophy that is a radical departure from the past. The VIZIV Evolution Concept at the Tokyo Auto Show 2013 tell us a lot about the future at Subaru. It’s going to include a new design philosophy and it will include fuel-efficient plug-in hybrid technology. Subaru isn’t satisfied with their past success and is building new vehicles that will propel them and their customers into a bright future.